An invasive leaf-mining moth, feeding on cornelian cherry, has been gradually expanding its distributional range from its native Central Europe northwards for a period likely longer than 60 years. During that period, it has remained under the cover of a taxonomic confusion, while going by a name shared with another species that feeds on common dogwood. To reproduce, this group of leaf-mining moths lay their eggs in specific plants, where the larvae make tunnels or ‘mines’, in the leaves. At the end of these burrows, they bite off an oval section, in which they can later pupate. These cutouts are also termed ‘shields’, prompting the common name of the family, the shield-bearer moths. 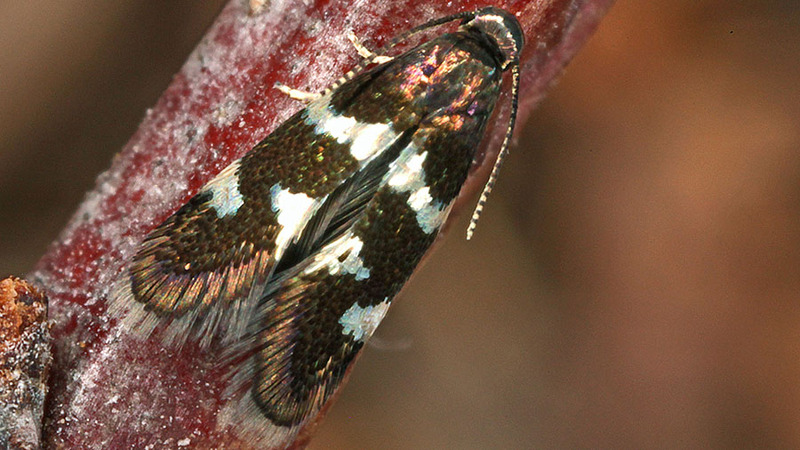 During a routine study into the DNA of leaf-mining moths, Erik van Nieukerken, researcher at Naturalis Biodiversity Center, Leiden, the Netherlands, discovered that the DNA barcodes of the species feeding on common dogwood and cornelian cherry were in fact so different that they could only arise from two separate species. As a result, Erik teamed up with several other scientists and amateur entomologists to initiate a more in-depth taxonomic study. Curiously, it turned out that the two species had been first identified on their own as early as in 1899, before being described in detail by a Polish scientist in the 50s. Ironically, it was another Polish study, published in the 70s, that regarded the evidence listed in that description as insufficient and synonymised the two leaf-miners under a common name (Antispila treitschkiella). Now, as a result of the recent study undertaken by van Nieukerken and his collaborators, the two moth species – Antispila treitschkiella and Antispila petryi – have their diagnostic features listed in a research article published in the open access journal Nota Lepidopterologica. While van Nieukerken and his team were working on the taxonomy of the moths, David C. Lees of the Natural History Museum, London, spotted a female leaf-miner in the Wildlife Garden of the museum. Following consultation with van Nieukerken, it turned out that the specimen in question was the first genuine A. treitschkiella ever to be found in Britain. Subsequently, the research groups decided to join forces, leading to the present discovery. Despite the lack of data for the British Isles, it is already known that, in continental Europe, the cornelian cherry-feeding species had established in the Netherlands and much of Germany in the 1990s. With common dogwood being widely planted, it is now suspected that A. petryi has recently reached Sweden and Estonia, even though there was no previous evidence of the leaf-miner expanding its range. “This discovery should provoke the attention of gardeners and other members of the public alike to the invasive leafminers attacking some of our much admired trees and shrubs, as we have demonstrated for the cornelian cherry – a species well-known for its showy red berries in the autumn,” says David Lees.